In What Should a Clever Moose Eat?, University of Minnesota, Duluth, ecologist John Pastor takes readers on a deep dive into the natural history of a place he clearly has a fondness for. An intellectual descendant of Aldo Leopold, Pastor chooses a domain far wider than the area of Sand County, encompassing the whole of the North Woods, which extends from the western shore of Lake Superior to the coast of Newfoundland far to the east. But his perceptive love for the ecosystem shines through just as brilliantly as Leopold’s did. Could the religious experience of sensing the presence of a higher being be a holdover from the infant mind’s adaptive expectation of a nurturing caregiver? 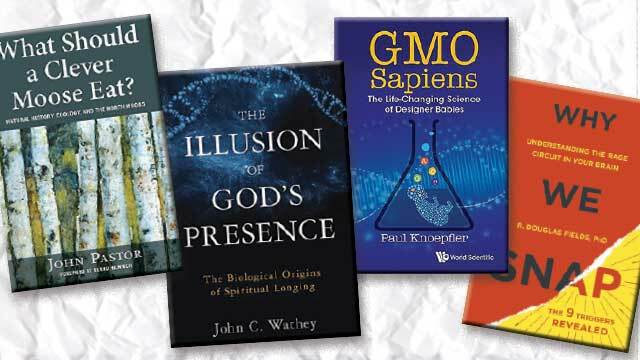 Such is the argument of computational biologist John Wathey, who writes of the evolutionary origins of spirituality and religiosity in The Illusion of God’s Presence. Genetically modified organisms (GMOs) are all around and in us. We genetically modified the plants we eat, the drugs we take, and the pets we cuddle long before we knew what genes or DNA were. But humanity has progressed far beyond the blunt instrument of artificial selection. Now we have razor-sharp genetic tools, and the ultimate culmination of genetic modification may be right around the corner—genetically modified humans. In GMO Sapiens, cell biologist Paul Knoepfler of the University of California, Davis, explores the recent history of genetic modification, and the ethically sticky proposition of using what we’ve learned about how to manipulate genomes to customize our offspring. From the early days of GMO crops and in vitro fertilization to the uncertain future ushered in by the relative simplicity of the CRISPR/Cas9 technique, Knoepfler traces the explosive rise of the technology that could make genetically modified humans a reality in the very near future. These days people seem to snap into a state of anger and violence rather easily. Perhaps it’s the expectation of instant gratification, the ceaseless bombardment of sensory stimuli, or the cultural glorification of violence and aggression that have caused such an uptick in the behavior. Whatever the external drivers, the process of losing one’s cool and reverting to a primal survival mode certainly involves internal biological processes that connect modern humans with their ancient forebears. This physiological cascade constitutes the focus of neuroscientist R. Douglas Fields’s new book, Why We Snap. Inspired by his own experience fighting back against a gang of pickpockets who tried to steal his wallet on a dim Barcelona street, Fields, a section head at the National Institutes of Health, details the triggers that might lead otherwise amiable people to hurl themselves into fits of rage. He coins the mnemonic device, LIFEMORTS—for Life-or-limb, Insult, Family, Environment, Mate, Order in society, Resources, Tribe, and Stopped—for the nine situations in which we are most likely to snap. The impulse to do so, however, lies deep within our genes, neurons, and brain regions, shaped by the imperatives of survival.